An Aide to Governor Darius Dickson Ishaku, the Governor of Taraba State, has debunked rumours of the death of his Boss His Excellency Governor Darius Dickson Ishaku. 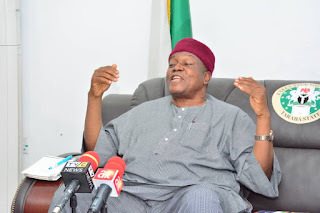 Some News platforms this morning had written of the death of Governor Ishaku with no cause of his reported death. starting a social media frenzy about the Governor being involved in a plane crash . However, an aide to the Governor, Hon. Nelson C. Len, quickly dismissed the story. Part of a statement by the Governor’s aide read: “Worried by the piece of propaganda, I want to state it categorically that the rumours was grossly unfounded". Said the Governor’s aide. “There is no iota of truth in the rumour making the round in the state and beyond that Gov. Ishaku is dead. His Excellency is healthy, energetic and full of life going about his official duties for the betterment of the state and Wondered why political detractors and enemies of progress would want him dead.